NTIS Accession No. of the report covered in this TechBrief: PB2013-130231. This document is a technical summary of the unpublished Federal Highway Administration (FHWA) report Material Characterization of Field-Cast Connection Grouts, available through the National Technical Information Service (NTIS) at www.ntis.gov. Prefabricated bridge element and system (PBES) construction concepts frequently rely on field-cast grouts to complete the connections between discrete precast concrete elements. A variety of grouts are available, each with unique performance attributes. The objective of this research is to evaluate the performance of a representative sample of grouts in terms of relevant material properties. This study both reports on the performance of eight specific grouts and provides general insight into the performance of five different types of grout. Although many of these grouts could be used in a post-tensioned connection system, the tests completed herein investigated the performance of the grouts in a non-post-tensioned condition. There is a growing need for durable and resilient highway bridge construction/reconstruction systems that facilitate rapid completion of onsite activities, thus minimizing intrusion on the traveling public. Modular components can provide high-quality, accelerated, and safe construction; however, offsite prefabrication of bridge components necessitates increased reliance on the performance of field-installed connections between components. The mechanical and durability responses of the grouts used in these connections are critical to the overall performance of the infrastructure system. Constructability and serviceability problems have arisen in connections on some past projects. These issues have been attributed to a variety of causes, including construction techniques, materials, and poor designs. Much attention has been placed on making better connections between components. One area of investigation relates to the different field-cast materials that might be used to complete the connections. Selection of a grout with appropriate fresh and hardened properties is a critical step in any PBES project. The grouts used in PBES construction projects tend to be prebagged, proprietary materials. The grouts are used to fill the interstitial void spaces within the details connecting adjacent prefabricated components. In most cases, the grouts serve to complete the connection wherein reinforcements emanating from one or both of the prefabricated pieces tie together the bridge system. A variety of grouts are available, and selection depends on the cost and the fresh and hardened properties that are of greatest interest to the bridge owner. Many grouts are cementitious products; however, materials based on alternate chemical reactions are also available. In this study, three commonly available cementitious grouts were tested. These grouts are referred to as G1, G2, and G3. A thixotropic cable grout (T1) and two ultra-high performance concretes (UHPC) (U1 and U2) were also tested. Each of these materials develops hardened properties through hydration reactions of the included cementitious constituents. A magnesium phosphate grout (M1) and an epoxy grout (E1) were also tested. These grouts rely on different chemical reactions but can perform similarly to conventional cementitious grouts. This study also included a traditional bridge deck concrete mix design (C1) as a control. Each of the grouts tested was acquired from a domestic manufacturer with a national distribution network. A technical data sheet from the manufacturer of each grout indicated necessary production information as well as anticipated material properties. At the time of purchase, most of the grouts ranged in cost from $800 to $2,200/yd3, with the UHPC and magnesium phosphate grouts at the upper end of this range. The lone exception was the epoxy grout, which cost nearly $4,600/yd3. Owners and specifiers considering the use of these grouts must recognize that the grouts tend to be used in relatively small quantities and in applications requiring specialized equipment and technical skills. Bulk material cost is only one aspect of the overall determination of the cost-benefit relationship inherent in the deployment of a particular bridge construction system. The testing program executed in this study focused on assessing the performance of the grouts in five distinct topic areas. In each case, standardized test methods were used where available and appropriate. When existing tests were not appropriate, alternate test methods were devised to investigate the property of interest. Constructability considerations relating to field-cast grouts include rheological considerations, setting properties, and necessary construction equipment. These performance measures were assessed through standardized flow tests, standardized penetration resistance tests, and qualitative assessment of the construction site equipment and process demands. The mechanical properties of the grouts were assessed through a range of compression and tension tests. Standardized assessments for density, modulus of elasticity, compressive strength, and splitting tensile strength were completed. The dimensional stability of castable materials is critical to the short- and long-term performance of the constructed element. Most grouts marketed for use in infrastructure applications are referred to as “non-shrink” grouts. However, even within this nomenclature, grouts are known to express a wide range of shrinkage depending on the materials, mix design, and curing environment. 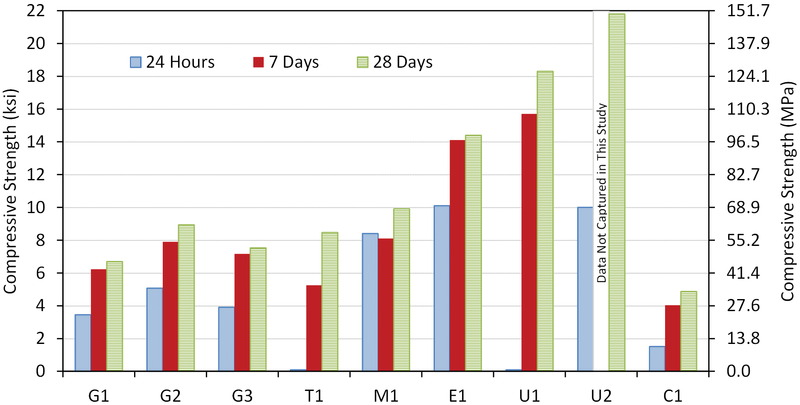 Long-term unrestrained and restrained shrinkage of the bulk grout materials were investigated in this study through standardized tests. Short-term unrestrained shrinkage was also investigated through a novel test method that captured dimensional stability beginning at initial placement. The bonding of a field-cast grout to the prefabricated component at the grout-component interface can be of critical importance to the long-term performance of the constructed system. Lack of bond can result in leakage at the interface and eventual degradation of the grout, bridging reinforcements, and precast component. Three bond tests were completed to assess the bond strength between field-cast grouts and prefabricated bridge deck concrete substrates. The slant shear bond test and the split cylinder bond test were based on existing mechanical tests, and the restrained ring bond test was based on an existing shrinkage test. Durability considerations are critical in the selection of a field-cast connection grout, as grout degradation can prematurely lead to the need to rehabilitate the entire structure. A select set of grouts were assessed through the standardized freeze/thaw resistance test and the rapid chloride penetrability test. 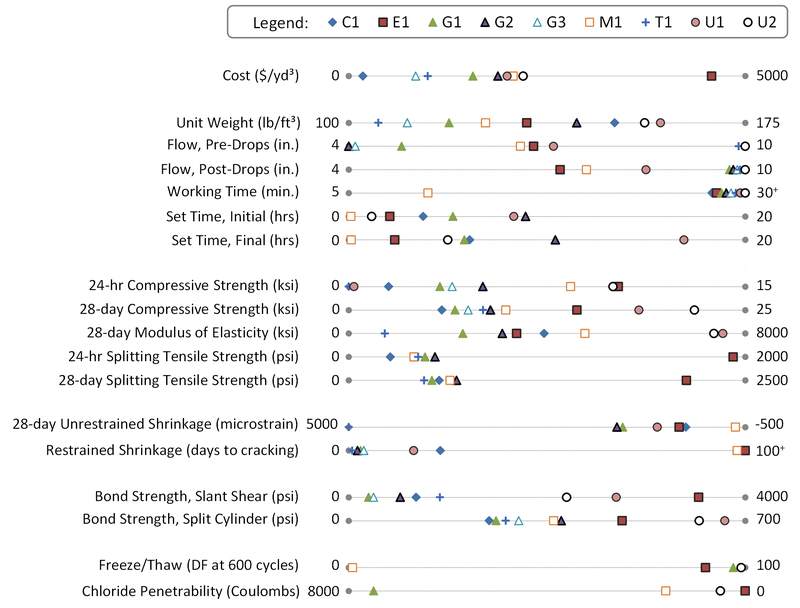 The grouts assessed in this study exhibited a wide range of performance on nearly every material characteristic. Depending on the application, different performance levels may be appropriate or may be of little relevance. Full details on the test methods and results are presented in NTIS report PB2013-130231. A summary of the compressive strength results is shown in figure 1. 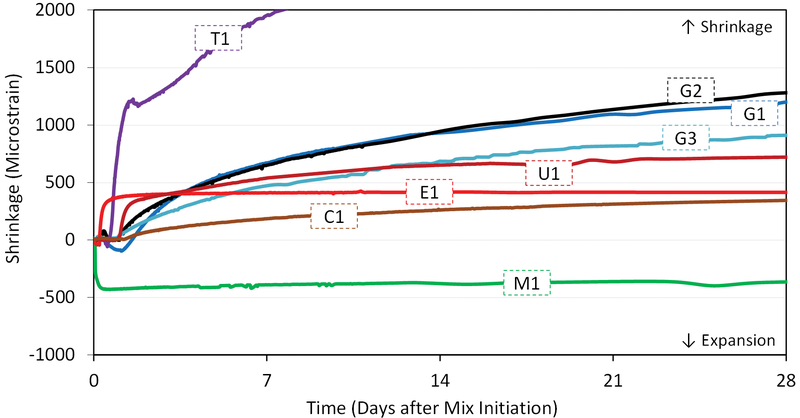 Results collected at 24 h, 7 days, and 28 days after mix initiation are plotted. Exceptionally high 7- and 28-day compressive strengths are clearly possible with E1, U1, and U2. The rapid-setting nature of M1, indicative of this class of grouts commonly used for repairs, affords substantial compressive strength soon after mix initiation. Figure 1. Graph. Compressive strength results. The overall shrinkage response of the grouts is presented in figure 2. These results were captured via an embedded strain gauge beginning at the time of casting. As such, these results show the initial dimensional instability that many grouts express early in their curing reactions. One grout, M1, was expansive. All of the other grouts exhibited shrinkage greater than the control concrete, C1. The conventional grouts (G1, G2, and G3) all shrank more than E1 and U1. Figure 2. Graph. Shrinkage results. A representative sample of the bond strength results is provided in figure 3. These results pertain to the splitting tensile bond strength test, wherein the field-cast grout is cast against the sandblasted face of a precast half-cylinder. The interface bond strength is measured through a splitting cylinder test with the interface aligning with the location of maximum tensile stress. For these tests, the interface was a finished concrete surface that had been sandblasted prior to the grout cast. The results show that three of the grouts, E1, U1, and U2, exhibited sufficient bond strength to force failure to occur within the precast concrete substrate. Figure 3. Graph. Splitting tensile bond strength results. Four of the grouts were tested for freeze/thaw resistance. The results are presented in figure 4. The test was extended beyond the normal 300 cycles in order to facilitate differentiation between three of the grouts. Grout M1 deteriorated rapidly under the cycling, while U2, G1, and E1 resisted the environmental stressor. Figure 4. Graph. Freeze/thaw resistance results. A graphical synopsis of the study’s overall results is presented in figure 5. The results for each parameter denoted on the left are plotted on the adjacent linear scale, and the limits of the linear scale are shown. This graphic allows for visual interpretation of the overall results of the research program, thus providing a simplified presentation of the performance of each grout. Figure 5. Chart. Summary of overall performance of the tested materials. The test program focused on characterizing basic mechanical, dimensional stability, and bond properties for eight field-cast grouts that could be used in connecting precast concrete bridge components. The results demonstrate that material characteristics, practical construction considerations, and cost can vary widely. These results and others must be carefully considered when selecting the appropriate grout to use in a particular construction project. For accelerated construction projects requiring high compressive strengths within 1 day, E1 and U2 displayed acceptable properties. E1 had sufficient strength gain, was one of the most dimensionally stable materials, and had good workability and high tensile strength. The material also developed strong bonds with the precast concrete in all three bond tests and expressed good durability properties. However, its comparatively high cost may limit its viability. U2 also displayed appropriate strength gain; was comparatively dimensionally stable; and had good workability, high tensile strength, and high modulus of elasticity. The material contains internal fiber reinforcement that can arrest cracking. This material expressed good durability properties. The material developed strong bonds to the precast concrete and had a unit price approximately half that of E1. An alternative for this type of project and for other projects requiring exceptionally rapid strength gain is M1. The greatest concerns with this material relate to constructability considerations, including its very limited working time, and its durability. The limited work time created problems when trying to quickly cast the material in the formwork. The freeze/thaw test specimens rapidly deteriorated. The C1 mix performed as well as grouts G1, G2, and G3 in most cases. The conventional grouts shrank more, had only modestly higher compressive strengths and bond strengths, cracked earlier, and cost substantially more. However, the rheological properties of conventional concretes combined with the sizes of aggregate commonly included in conventional concrete present fundamental hurdles that are addressed by the conventional grouts. Owners, specifiers, and designers considering the use of field-cast grouts for PBES connections should carefully consider the performance measures that are of greatest interest before, during, and after deployment of the application. Many classes of grout-type material are available, with each offering different performance levels relative to different performance metrics. In all cases, it is important to ensure that the connection design is constructible, durable, and economical in the near term and over the life of the constructed facility. Key Words—Field-cast grout, Prefabricated bridge elements and systems (PBES), Mechanical strength, Shrinkage, Bond strength, Durability, Constructability.